Dawn McRoberts is the owner of the mobile nail tech service High Five Nails in Tullibody, Scotland. 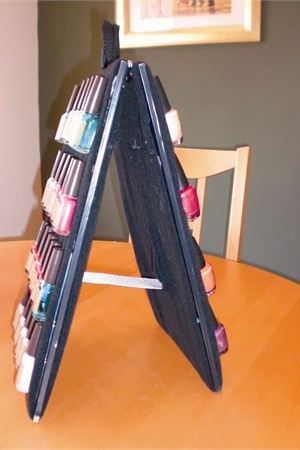 She created this polish display so she can nicely show her polishes to customers wherever they may be — giving them a small bit of the salon feel in the privacy of their own home or workplace. “The boards came about when I became a mobile tech and realized I wanted something better to carry my polish than a toolbox or a bag. It started out as a single-board design, with a handle on the top, and bottles on both sides of the board. Between 2008-2009, I made a number of these boards for other nail techs who saw them after I posted some pictures on Salon Geek. But as they were time consuming to make and heavy to ship, I had to charge £30 (plus an additional shipping charge of £5 in the U.K.) and there weren’t a great number of people who were willing to pay that. I looked into patenting the design, but the expense was more than I could invest and I doubted it would have a huge target market. While there are a huge number of nail techs around the world, only so many are mobile and only so many are willing to invest in something like this. I finally decided to just throw the idea out there when I saw so many nail techs asking how to carry their polishes. People can make them to suit themselves, and while I realize I may be shooting myself in the foot (if someone does make a fortune off the idea), I just wanted to share this idea. 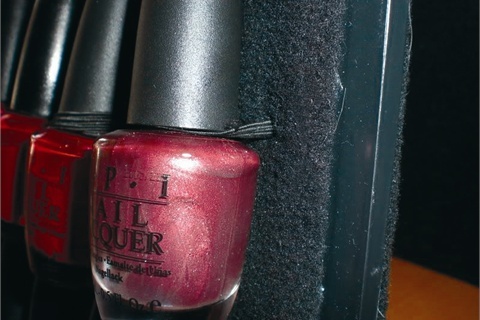 If it helps other nail techs make their job easier, I’m thrilled with that! It’s two Medium-Density Fibre (MDF) boards, covered in black polar fleece (which cushions the bottles). The bottles are held on with elastic ‘seatbelts,’ which are woven between holes drilled in the boards. Then I hinge the boards together, add a handle and a strap to keep the boards from falling open, and there you go.